The broad and developing scope of ergonomics — the application of scientific knowledge to improve peoples’ interaction with products, systems, and environments — has been illustrated for 25 years by the books in the Contemporary Ergonomics series. Reflecting the name change of the Ergonomics Society to the Institute of Ergonomics & Human Factors, the peer-reviewed papers in this volume embrace a wide range of issues related to ergonomics. International contributors provide insight into current practice and present new research findings. They cover an array of topics, including defense; hazardous industries; human factors integration; inclusive design; medical; methods and tools; occupational health and safety; slips, trips, and falls; transport; and applications of ergonomics. Mirroring the 2010 conference, the book includes a memorial to Professor Tom Reilly and a symposium on creating a learning organization. 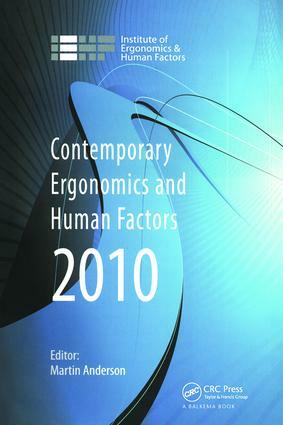 Ideal for mainstream ergonomists and human factors specialists, this invaluable reference source is also suitable for those concerned with people’s interactions with their working and leisure environment, such as designers; manufacturing and production engineers; health and safety specialists; occupational, applied, and industrial psychologists; and applied physiologists. The Institute of Ergonomics & Human Factors (on 20th October 2009, the Ergonomics Society changed its name to IEHF) is the professional body for ergonomists and human factors specialists based in the United Kingdom. It also attracts members throughout the world and is affiliated to the International Ergonomics Association. It provides recognition of competence of its members through its Professional Register. Martin Anderson (FIEHF, EurErg, CMIOSH) is a graduate in psychology with two Masters degrees in Ergonomics, and Process Safety & Loss Prevention. He has specialised in the area of human factors and safety management, particularly in relation to major hazards and complex systems. Since 2001 he has been a Specialist Inspector at the Health & Safety Executive (HSE), gaining wide experience of regulating human, management and organisational aspects on over 100 major hazard sites. He currently works in the Offshore Division of HSE where his work includes planned inspection, incident investigation, safety case assessment, provision of expert evidence and formal enforcement. Before becoming an Inspector, Martin worked for two consultancies and the Health & Safety Laboratory (HSL) - working in a range of industries including commercial aviation, railways, construction, coal mining, electricity, oil and gas, nuclear, and chemicals. He is a regular conference speaker and lecturer, and has been a member of the IEHF Council since 2003.